A favorite pastime of many is to sit in a coffee shop amid the robust perfume of freshly-ground coffee beans softened by the creamy fragrance of steamed milk, light conversations, tap-tap-tapping of laptop keyboards, and flipping of textbook pages, while sipping a fresher-than-fresh gourmet coffee any way you like it. While you may think a certain famous worldwide chain has the market cornered on delicious coffee in a relaxing atmosphere, these independent cafes offer a little something different … Hoosier charm. BIND Café is one part of a multi-use coffee room dedicated to the spirit of wanderlust with a side of learning and washed down with a hot cup of fair-trade coffee. Located within a space shared by three globally-minded organizations (Beyond Borders Language Learning Center, Beyond Barcodes BookStore, and BIND Cafe), the refreshments and light meals offered on the cafe's menu are handmade in-house and accompany fair-trade coffees and teas—that is, they are not the product of forced labor or unfair wages in other parts of the globe, but instead are products of free enterprise by well-paid workers. Internet reviews are nothing but positive about the owner, atmosphere, flavors, and comforts of the combination bookstore/coffee shop/board game room/bookstore/tutoring center. Indianapolis's Best Coffee Roaster, named by Indianapolis Monthly, is the Bee Coffee Roasters. Working off the belief that “coffee is culinary,” every barista at the Bee is highly trained and always learning to roast beans in small batches to call out every flavor within the brown gem and then freshly grind immediately before brewing and serving, for a truly artisanal cup of coffee. With two locations in within the circle of Indianapolis, Bee is ready to win you over with their craftsman-style cup of java. Don't be fooled: Hubbard and Cravens' four central-Indiana locations don't mean they're a one-brew-fits-all chain. A mini-chain within central Indiana, Hubbard and Cravens has not forgotten its neighborhood roots as a happening little spot for a hot cup of artisan blend coffee or elegant tea. The owners now travel the globe in search of conscientiously produced beans so their loyal customers can sip peacefully. In addition to their four shops in the state, they also supply their delicious drinks to restaurants, hotels, and college campuses, including Ball State's Bookmark Cafe, located in Bracken Library, first floor northeast. Named for the SoHo Artists Association begun in 1968 Manhattan, the SoHo Cafe and Gallery is a perfect blend of coffee and art. This “Counter-Culture Coffee” spot serves fair-trade and organic coffees from around the world, with an explanation on their website of exactly what a cup of their coffee signifies with regard to certifications and international trade laws. Ever interested in promoting fairness and independence, SoHo also holds open mic nights and special concerts for local performers, art shows for independent artists, and comedy nights for the joy of laughter paired with a creamy latte. Just want to sip in solitary silence? Then the couch beside the electric fireplace is snug perfection. Are you after a hot cup of fantastic brew with a side of something a little more substantial than a doughnut or scone? Or perhaps something a little stronger? Roscoe's serves much more than coffee and refreshments. They're more of a restaurant with an amazing coffee bar, complete with a wine and beer selection with locally sourced craft beer on tap. Their food menu is both rich and clean, with lighter choices like gourmet salads that are much more than just fru-fru dressing on fru-fru lettuce, and heartier plates like freshly grilled burgers and real bacon on that BLT. Of course, they haven't forsaken the java: Their coffee bar sports 16 coffee and tea choices, 16 signature lattes, seven fruit smoothies, eight frappes, and two specialty choices. Most of these options are customizable with extra flavor shots. At first glance, Calvin Fletcher's is your standard coffee shop with tasty snacks and organic fair-trade coffee selections brewed to perfection and/or crafted into expert espresso or blended drinks. However, Calvin Fletcher's does something most others don't. Sure, you can sip conscientiously on your fair-trade, no-chemicals, no-preservatives coffee, but Calvin Fletcher's takes that a step further and donates all profits to not-for-profit organizations and charities. That's right … every sip at Calvin Fletcher's is a pair of shoes for a child and a helping hand in hardship. While there's nothing wrong with turning a buck, this coffee shop is in the business for reasons other than making a living … they're interested in improving it. Getting a cup at Darrin's Coffee Company is like kicking your feet up at your best friend's place. 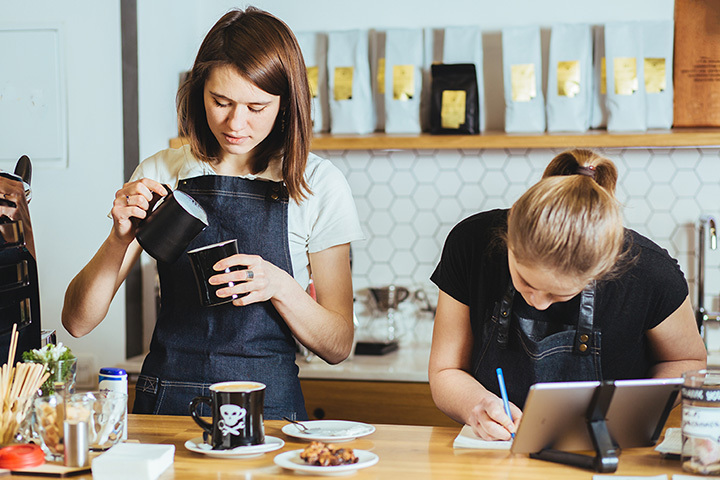 They're truly a top pick for friendly baristas and staff with a sense of humor, which pairs great with any of their specialty drinks made from freshly-ground-in-house beans. Laid-back atmosphere and a down-to-earth team bring artisanal coffee out of the snob section and into the peanut gallery. Healthy breakfast and trendy lunch are also served with a smile along with your choice of brew. In addition to hosting high school art shows, open mic nights, and various local support groups, Darrin's also rents out their space for your own private parties (but if it's something that would give you the urge to run if a cop walked in, don't ask Darrin's to host it!). The atmosphere of Perk Up is the perfect blend of elegant and cozy. Warm colors and dark wood pair deliciously with the crafted coffees, gourmet breakfast and lunch selections, and German baked goods (we're not kidding on this one, folks, one baker is a German immigrant and the other is a German-baking-school-certified chemist). Thanks to the free Wi-Fi, it's a study spot, business corner, get-things-done-in-a-relaxing-atmosphere space, and adorable date destination that takes “let's grab a cup of coffee sometime” to another level. Is your only date your dog? That's fine too … Perk Up is pet friendly! Pretty much all you need to know about Zing is in their song which plays automatically when you click onto their website, but since you're already here, … the Village of West Clay is home to a comfortable yet hip coffee shop and lunch spot that is part updated historic building and part beloved youth-group lofts of our teen years. The food menu is just hip enough to make you feel good about what you're putting in your body (to lessen the guilty sting of the sinfully delicious mocha you just ordered) and just homey enough to give it the feel of comfort food with a modern gourmet twist. Have to share this amazing past-and-present fusion menu with your friends? Zing offers catering services, as well as gift cards that stay in your loved one's stocking a lot better than the actual mocha. This small business is making a big impact in the historic district of Muncie. Husband-and-wife owners Frank and Lauren know that the best way to revive a sleepy community and fuel their efforts to revive the struggling city is to caffeinate the citizens, and it's working like a charm. The nationally-registered historic Freund Building in Muncie was built in 1903, and is now home to Murray's Jewelers, a handful of other businesses, and, on the “ground” floor (pun totally intended), The Caffeinery. Its open concept and interior design pay homage to the building's original appeal, down to the restored-to-Historic-Registry-standards flooring, with a comfortably modern twist that enhances the community's artistic endeavors to enrich the city through art and design.